If you’re a city dweller, waking up to smog around the tops of buildings is a normal occurrence, and socially we accept this sight. We might even take it for granted. Dutch designer Daan Roosegaarde and his team of engineers have developed the world’s largest smog-sucking vacuum cleaner that has the potential to rid cities of pollution. 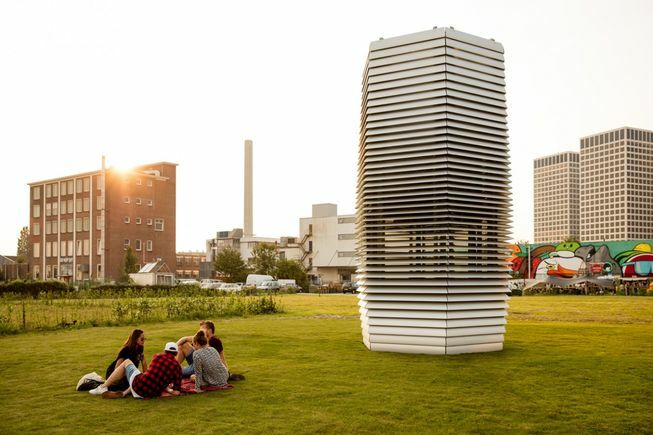 The Smog Free Project launched the seven-metre-tall air purifier on Friday from the Roosegaarde Studio in Rotterdam, the Netherlands. Its white, tapered exterior uses technology borrowed from the indoor air purifiers used in hospitals, only on a much larger scale. The tower runs on green energy, sucking smog in through the top and releasing clean air out through its six sides. Using just 1,400 watts of electricity – no more than a household toaster – it’s able to create smog-free spaces in cities. Roosegaarde’s tower will start in Rotterdam and eventually travel the world, visiting cities like Beijing, Paris and Los Angeles so that people all over the world can experience clean air and help to further develop the project. 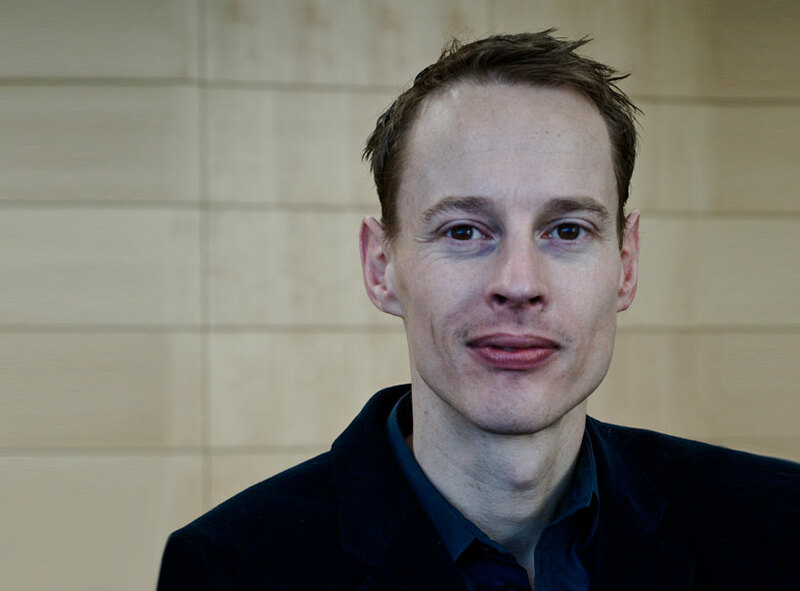 “I think the smog-free tower, the smog-free park, the bubble of clean air creates a place where NGOs, concerned citizens, makers like you and me can meet, can work, can think together; do what we need to do to make a city smog free,” Roosegaarde said in his Kickstarter campaign video. So far, the campaign has been extremely successful, exceeding its goal of raising €50,000 with seven days still left to back the project. 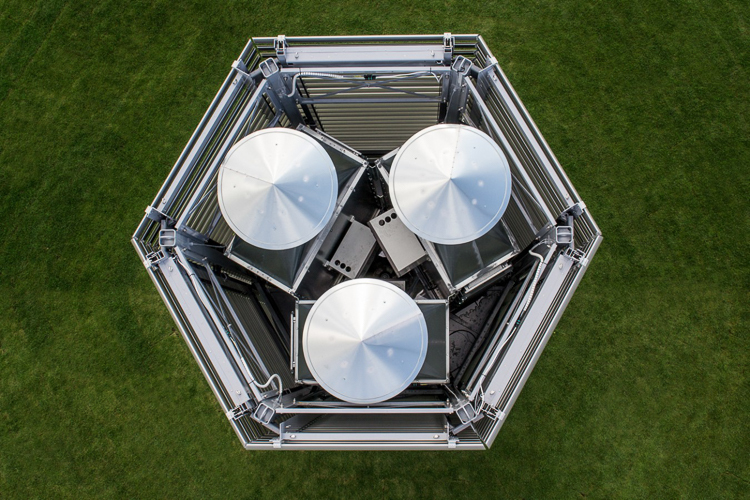 Its modular system – a­­ design approach that creates smaller parts which can be used for an alternative use ­– cleans 30,000 cubic metres of air per hour. This process eliminates smog by releasing positive ions that attach themselves to ultra fine dust particles, trapping them to be stored inside the tower. Once the dust particles are collected, they form a black powder consisting of 42 per cent carbon that could easily be confused with ground charcoal. 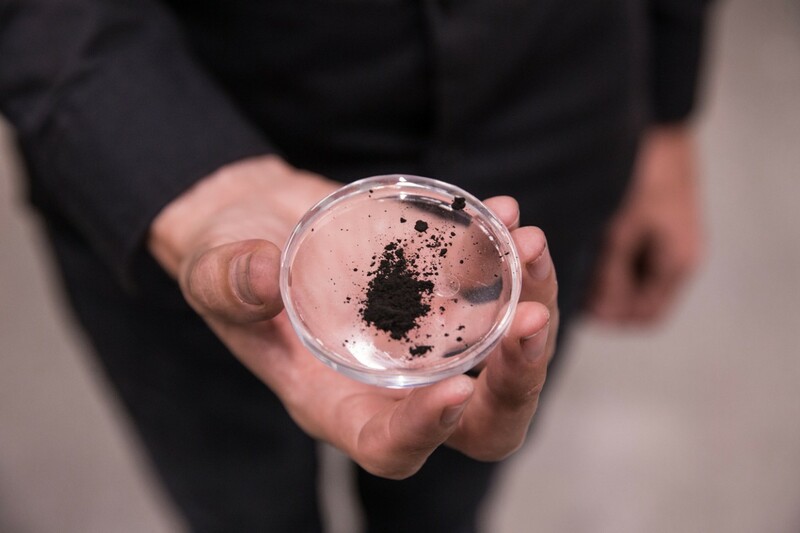 Since Roosegaarde believes that in the future there should be no waste, he decided to compress the powder into smog rings and cuff links for campaign supporters to receive in return for their donation to the project. 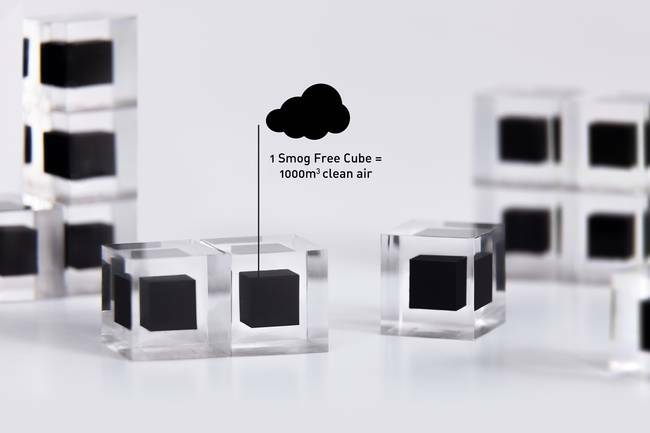 Each smog cube symbolizes a thousand cubic metres of clean air for the city that the tower is in. Good innovation for cities that can’t plant tress….but trees are the true air purifiers of the world…. Yes, you are quite right – let’s plant trees! The US is so out of touch. this is ok but the root cause it not addressed. it will be in the next 20 years permenantly with something that will surprise us all. the truth is coming have heart felt love for earth and she will clean herself and we will begin the change of our way of transportation . Great as a bandaid but we need to stop producing the smog in the first place, reduce carbon production and plant more trees!!!! Could I have one of these sent to the Gurney Unit in Tennessee Colony? …maybe two? Someone has an eye on a series of highly lucrative Chinese sales deals. Clever investment to develop this.